Decompression therapy is an FDA cleared therapy for non-surgical relief of herniated spinal discs. Whether herniations are caused through a degenerative process or a traumatic injury, the pain they cause is very real. The disc bulges out and puts pressure on the nerve exiting the spinal cord which generates terrible pain. This pain can travel into the arms or legs making it difficult to walk or stand up. "There is non-surgical help for herniated discs! Decompression Therapy!" Antalgic Trac is a 4TH Generation Decompression table that not only decompresses the spinal disc with an axial traction, it can flex and rotate which allows us to direct more of the treatment to the area of the herniation. This has revolutionized the decompression process and has allowed us to treat those difficult cases that have failed other treatment protocols. Call today to schedule a complimentary consult to find out if Antalgic Trac Decompression Therapy could help you. We invite you to bring any past MRI's, X-rays or past failed treatment notes for us to review. 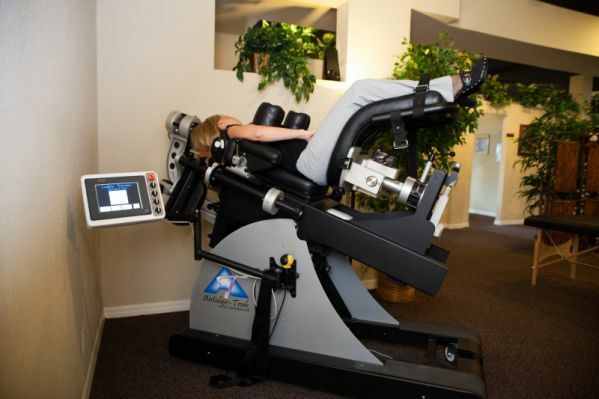 This will help us determine your success with Decompression Therapy.